I'm glad *somebody* is thinking 10 years down the road! Happy New Year, Mark and Smashwords. Happy New Year and thank you to all at Smashwords. Wishing everyone a great 2016! 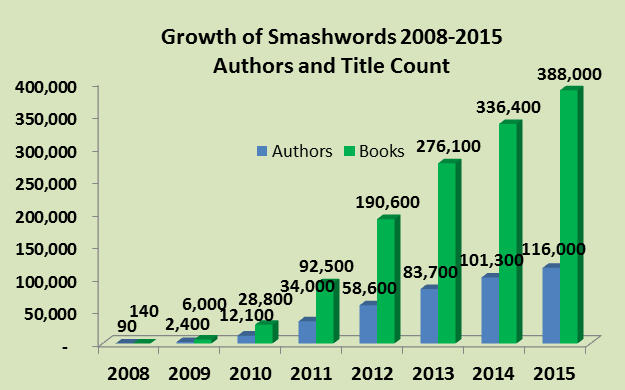 Thank you, Mark and all the people who work at Smashwords for all that you do to help the Indie authors. I am looking forward to your plan and surprises to make 2016 awesome! I edit The National Fantasy Fan n3f.org, more or less the oldest SF fan magazine in the world (founded 1941, now on volume 75). I would like to reprint, if I might, part of your article, the lead section, the business highlights, and contact information, for the benefit of our member-subscribers, many of whom are aspiring authors. As an aside, I gave up on trying to get in the door via paper publishers, even after a professional sale, because it took impossibly long -- current pro ms. is approaching four years at a publisher -- given my age to get an answer as to whether or not they wanted to buy my work. yes, my pen-name got hijacked too. Tough. yes, I follow best practices... tho widgets for the more rabid fans is a stretch yet. Kevin williams. 2016 jan 1st (hey, i usually do an AI article today. E-book instant translations from any lag to any lang? Thanks, as ever, for your end-of-year roundup, Mark. It's nice to remember all of the improvements made over the course of a year, as well as ponder what the future will bring in the ebook world. To more beautiful storytelling in 2016! Totally lucid comments posted by a leader in our self-publishing industry. Many thanks Mark Coker and Jim Acevedo for your good work in 2015. I've appreciated your distribution over the years. I also like your retail store. It's my preferred place to pick up ebooks, and I actually sell ebooks at your store as well. I've been using the widgets on my blog too because I regularly do promos for the SW store. I'm looking forward to enhancements on pricing and promotions. Being able to schedule sales would be lovely. 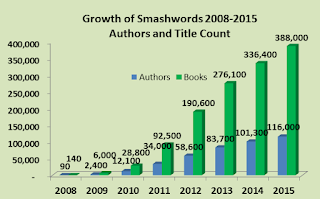 I joined Smashwords when there were about 12,000 authors and about 50,000 titles. Congratulations and best wishes for continued success. Hi Mark, is there a timeline for when the pricing tool in foreign currencies will be available? It's especially important for book promos. You guys have done a wonderful job! Congrats! Something that would be nice to see would be more promotion of mid-list authors. Smashwords does a great job of partnering with other sites to push the best sellers - who are already best selling and don't necessarily NEED a push (beyond the fact that everyone can always use more advertising), meanwhile there are midlist authors who have no hope of hitting that best seller list (often because they were not traditionally published before, so didn't come with a fan base already established) and who have a great book, with good reviews, who could really use the push/spotlight. And before anyone says anything, I'm not talking about myself. I doubt I even score into the mid-list sales, however I've heard from several other authors who do and wish there was some way they could get promoted. Right now Amazon does zero for it's authors except to list the best sellers repeatedly, so I admit it would be great to see Smashwords really stand apart in that way. sigh. yah, keep the peanut gallery quiet on this one, Ok? All of that is just lovely but all I want you to do is fix the fracking meatgrinder already. And don't bother blaming it on not following the Style Guide because you can follow that thing to the letter and still get a garbage NCX conversion. Hi Tony. If you follow the instructions in the Style Guide or the video I created that shows how to build enhanced navigation, you should get reliably great results every time. If you're up for a friendly challenge I'm happy to invite you to email me any Word doc for which you believe you followed the Style Guide's instructions for navigation and I'll take a look. If I can't identify an error, I'll eat my words here. :) If you've discovered a bug or an error in our instructions, I'd love to know. Thanks in advance. Lulu converted my ebook in 3 minutes. I've given you three days I'll never get back. Where do you want it emailed, Mark? My email is mc @ you know where dot com. If you email me a link to your book page, that'll be even better.